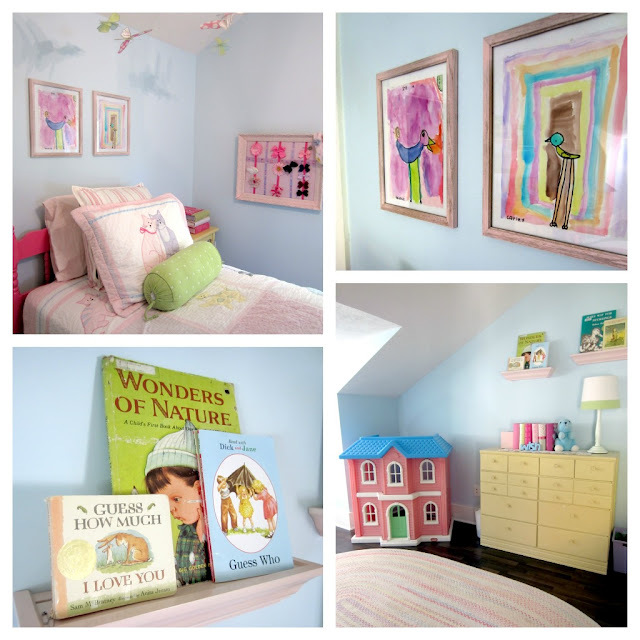 My first imaginings of beautiful rooms centered around little girls' rooms. Once, when my mom was looking through a Better Homes and Gardens, I found my dream room. She let me tear the page out and keep it. My childhood didn't involve a lot of decor since for a time our bedroom was the living room and our bed got folded away during the day. So I may have been on overdrive when I planned Cadence's room. Much of it originated with the kids nursery that was all bugs and butterflies in a gender-encompassing garden theme. Even the nursery walls were this sky blue. All we had to do was find big-girl bedding and throw in some hot pink! Well that's not quite all. Brian helped by finding the dollhouse in someone's trash and I spray painted shelves for vintage books I wanted out of reach. You may notice the same "ballet slipper" color on several objects around her room. I loved it, clearly, and if you do too, it's at Hobby Lobby. 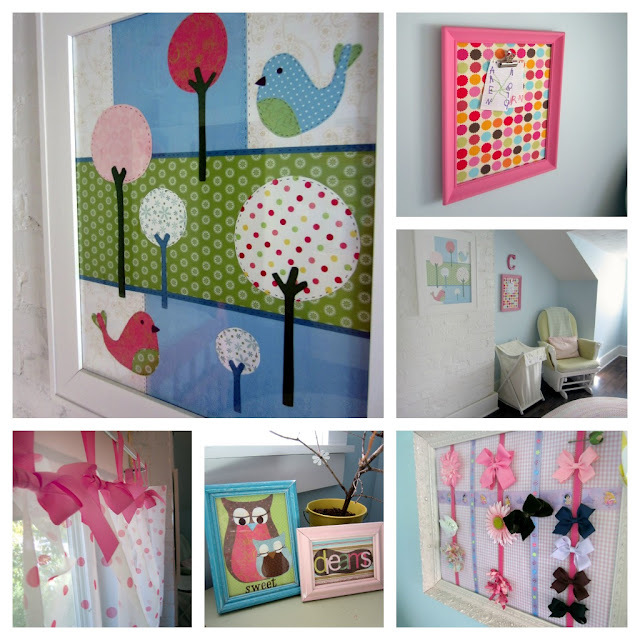 I made the tree and bird paper art to look like a quilt I was in love with in Pottery Barn Kids. I used more scrap paper to make the little owls to wish Cadence sweet dreams, since she struggles with bad ones. I made the hair ribbon caddie and let it be a place where we indulged in her love for Disney princesses. The strip across the back features several of them as does the face clock on her night table. I'm not anxious for her to be surrounded by these stereotyped ideas of womanhood, but I want her to know I care what she likes too. So we look for a middle ground where she feels taken into consideration. After all, a pretty room is only a wonderful place to be if the people in it are loving you. What a cute little girl room! I would have loved this when I was little. I especially love the sweet dreams pictures... adorable! Will you share what is the wall color?